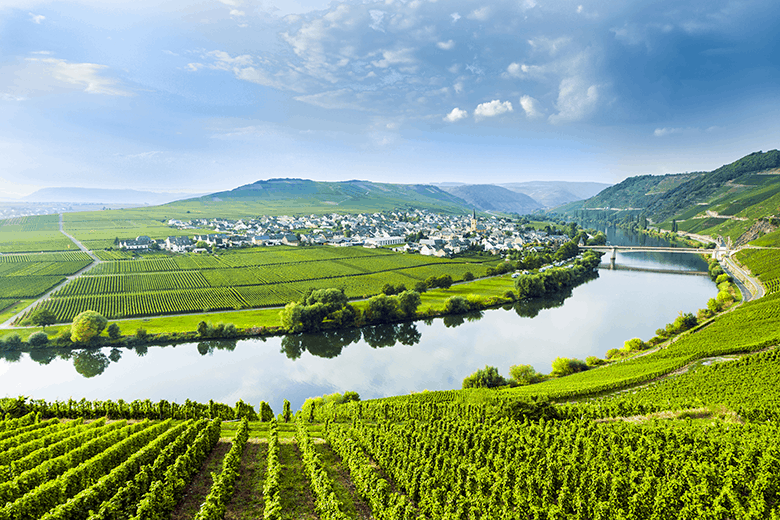 Fodor’s travel guides describe the Mosel as “one of the most hauntingly beautiful river valleys on Earth”. The river winds and loops through a gorgeous landscape of hills clad green with forests and vineyards. Delightfully pretty towns dot the banks and castles reach for the sky. The romance of the Mosel comes from the intimate feel of the narrow valley, the small towns with crooked streets and colourful half-timbered houses, and of course the quality of the hospitality – quality, character accommodations and hearty, superb food. A rowing trip here feeds your body, spirit and soul. The Mosel offers all the elements needed for the best kind of rowing tour. There is a beautiful river. We have a clear destination – row to the Rhine. The boats are only trailered once – to the upstream start and then we row them home. Daily distances mean that you get lots of catch, drive, release, recovery. The current helps us along and natural rests are built in when we go through the locks. There are typically one or two a day. It is such a good river for rowing that clubs are found at regular intervals. At some clubs we store our boats overnight, while at other clubs we stop to meet local rowers over lunch or dinner. This is what rowing travel in Europe is all about. Wine and rowing seem to be a natural pairing, especially after the rowing is done for the day. Some of our trips pass through great wine regions, in South Africa and France. But what could be more perfect than rowing through a famous wine region as harvest is taking place? 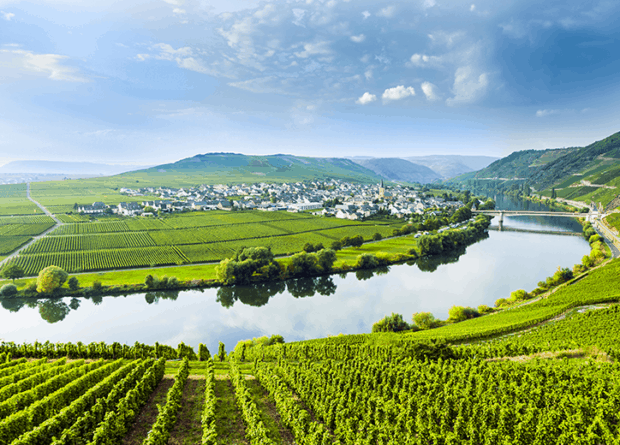 The Mosel wine region has the steepest vineyards in Europe, producing excellent wines, especially whites, of character. At the time of our trip, the harvest will be underway. All the grape picking is done by hand – a rather athletic undertaking considering how steep the vineyards are. Don’t worry if you are not a wine enthusiast – you will still be very welcome on and enjoy this beautiful rowing trip in Germany. Need some extra reasons to row the Mosel River? Check out this blog post for six good ones! 7days/6nights with four days of rowing. Arrival in Germany. We meet in Koblenz and will travel by vehicle to our starting location in Bernkastel-Kues. These are actually two towns, one on each side of the river. In Bernkastel, cobblestone streets lined with half-timbered houses lead to the pretty Markt, a square with a 17th century fountain. Kues’ claim to fame is St. Nikolaus-Hospital founded in 1447. Only 33 lodgers were permitted, the same age as Jesus when he died – a tradition that continues today. Inside the hospital is a local wine museum. This evening we will enjoy our welcome dinner with, of course, local wines. The rowing begins. Traben-Trarbach is our destination, 22.4 km and one lock away. We will row past typical wine villages such as Ürzig and Kröv, stopping for a picnic lunch in Kinheim. Traben-Trarbach is another twin town straddling the Mosel. We will stroll the promenades along both sides of the river, but will linger a little longer in Traben to explore its unusual collection of art noveau buildings. In fact, our hotel is one of them. Need we say that we will have more wine with dinner this evening? From the rowing club in Traben-Trarbach we are back on the water, continuing our descent of the Mosel. We will stop for lunch at another rowing club in Zell. This club is at the point of an enormous loop in the river. As one guidebook puts it: “One magnificent vineyard follows another”. The grape pickers will be so close that we might feel that we can touch them. Or at least call out “Guten Tag!”. We leave the boats at a canoe camp, then relax for a short drive to Cochem. We will settle into our hotel here for three nights. Today is a break from the water, as we explore more that this region has to offer. Our first visit is to the stunning Maria Laach Abbey, beautiful in its size and simplicity. This Benedictine abbey was founded in 1093 on the shores of a lake. We will take time to walk around the lake and experience the tranquility of its setting. After a tasty lunch, our next stop will be Burg Eltz. This castle has been compared to castles built by King Ludwig in Bavaria and is just as visually gorgeous. More walking is possible here too, but we could also be intrigued to explore nearby volcanic mountains. Back to Cochem. Tonight we have organized a special wine tasting dinner. We drive back to Eller to our boats and continue the rowing. What fun to row back to Cochem, this time stopping a lovely lunch at the local rowing club. We will have enjoyed this attractive town from the land, so it will be a special pleasure to get to know it from the water. Especially stunning will be to see the striking Reichsburg rising tall above just the right bend in the river. This afternoon, when we return to Cochem for our final night here, we must take the time to walk up to this 1,000 year old castle and see the river from a different perspective. First we need to row some more to the rowing club in Treis-Karden. Transfer back to Cochem. Dinner is on your own this evening. Our last day of rowing is our longest – good thing that there is a current. We will row from the club in Treis-Karden to Ruderclub Rhenania in Koblenz, just above the confluence of the Mosel and the Rhine. This is where our guide, Hans-Jürgen, learned to row, so he knows the waters well. The scenery continues to be spectacular. More vineyards, more castles, more charming towns and villages. We might be tempted to stop in photogenic Alken with its Burg-Thurant, but our picnic lunch waits for us in Oberfell. Our farewell dinner will take place in the restaurant right in the rowing club in Koblenz. There will be wine. What a perfect pairing with rowing. This morning spend time exploring the town and setting of Koblenz, first founded by the Romans. Go to the Deutsches Eck, the spit of land where the Mosel meets the mighty Rhine, or see this confluence from Festung Ehrenbreitstein, Europe’s largest fortress, towering 120 metres above the water. All too soon it is time to depart, but we are sure that you will take with you fond memories of Europe’s most romantic river. And maybe a souvenir bottle of wine or two.